From the UK the only direct flight at the moment is Easy Jet. The flight is 3hr 40 mins from Gatwick. I had never travelled on Easy Jet so was expecting delays, no cabin bag space and sitting on my own. I was very wrong- we only had hand luggage that just met the required measurements, there was plenty of space to put our bags in and we managed to sit together. I was also amazed that with Easy Jet as long as you can carry your bag and it meets the size requirements there are no weight restrictions for cabin bags.The flight attendants were pleasant, plane was clean, ride was smooth and the whole experience exceeded my expectations. I didn’t have any food on the plane however noticed the prices and they were not too bad. The only issue with the flying part of the holiday was departing from Santorini airport. It is the smallest yet busiest airport. There is one duty free shop and barely any seating. We went in October which was coming towards the end of their season and there was still no where for us to sit. Passport control was slow and it was hard to find any staff in the airport to speak to. They do have an open terrace with additional seating but you have to walk up two flights of stairs which with cabin bags isn’t great. 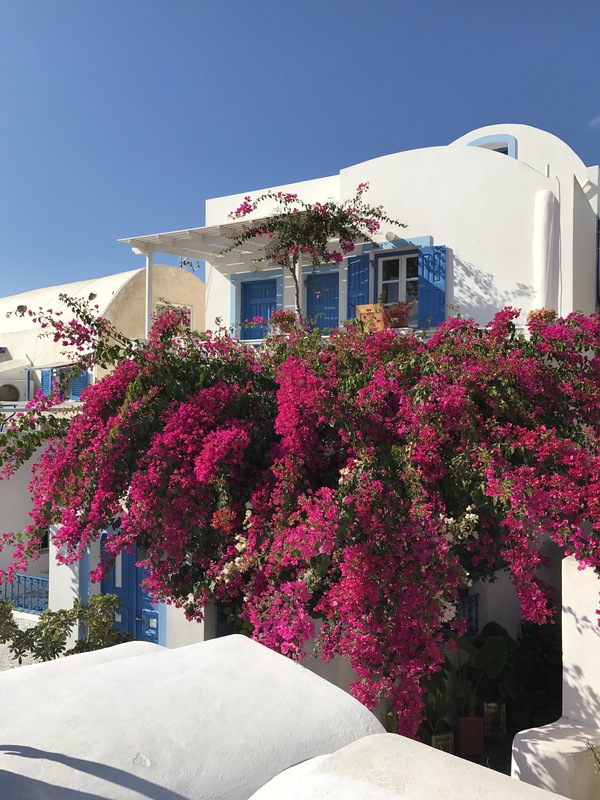 Before we booked the holiday everyone kept saying it was really expensive in Santorini so we didn’t want to pay silly amounts for our flight and hotel and we didn’t- we got our flights and hotel for 5 nights for £890. Bargain! We did however travel in the middle of October. 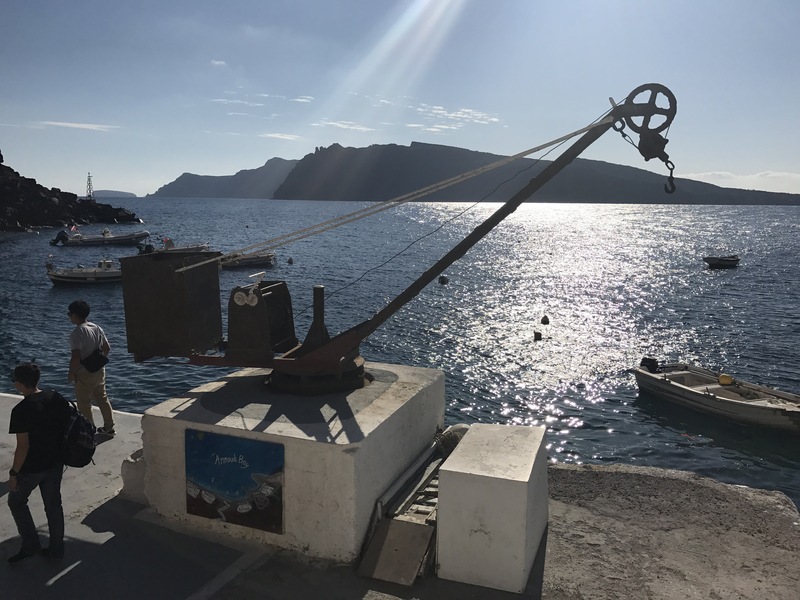 Previous weather statistics showed in the middle of October the temperatures in Santorini vary from 19 to 26 and that was pretty much the temperature ranges we got. We had two days that were windy however when the sun was out it got hot. There was no rain and the clouds were minimal. We chose Fira as our destination. We wanted something on the Caldera (volcano) side rather than beach side. For one, this was much cheaper than Oia and secondly from the reviews it seemed like more happened in Fira. This is also the main town where all buses go from. I think it is the port most cruise ships stop at too. We stayed at the Majestic Hotel which was supposedly a five star hotel. The hotel is clean and nice. It has all the facilities you need. 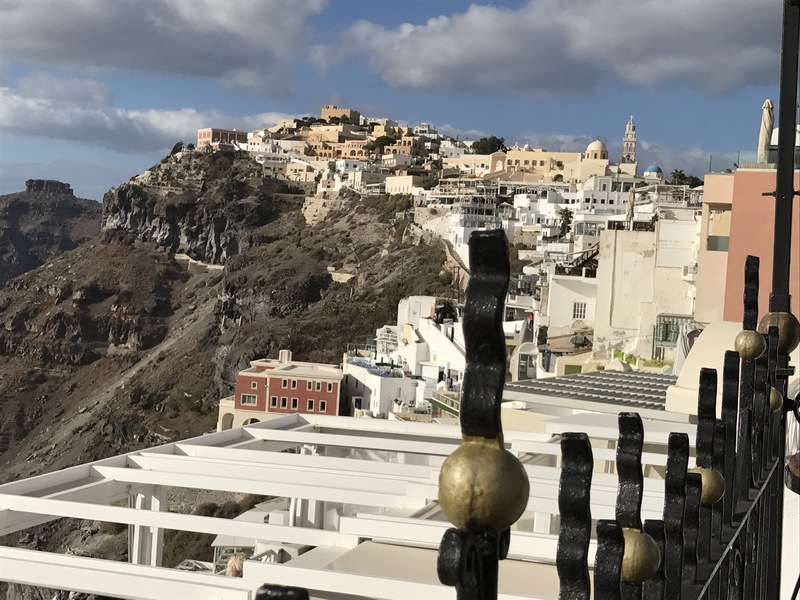 It is not actually on the caldera slope like many of the Oia hotels are. There is a main road in between the hotel and the caldera however I didn’t see any other hotels in the area on the actual slope. The hotel was 10 minutes stroll to the main town centre which was great. 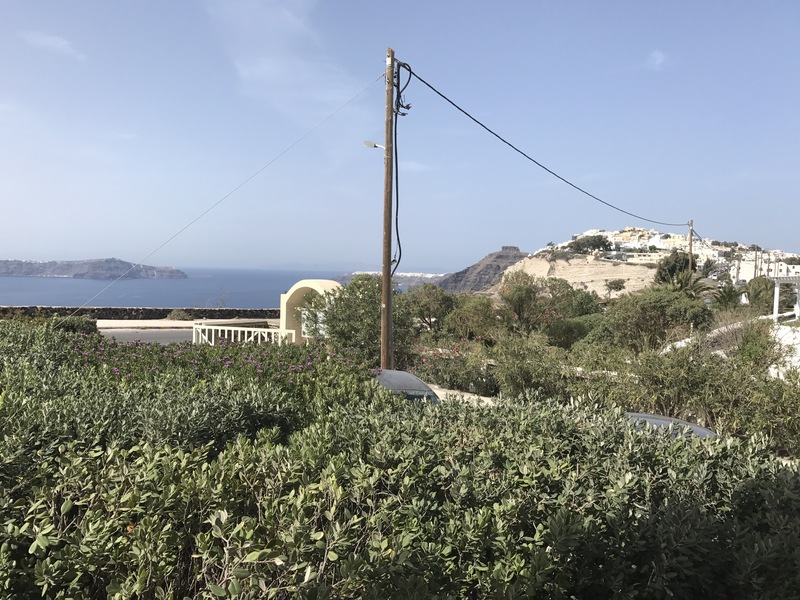 The views were not too bad from the room-we were facing the caldera side. The hotel had two pools- one was too cold but the other one was fine. The staff were friendly enough and able to assist when they could. The breakfast had a wide range of food- both continental and English breakfast. The room facilities were good- each room has a balcony and jacuzzi bathtub. The only downside was their heating/cooling system only works one way. The temperatures at night dropped a bit and the hotel temperature control system was set at cooling rather than heating. The hotel had to decide when to switch the system over and they did after a couple of days. Our first night we were in room 101 and we did feel the cold because it was the corner/last room in the block. Also it was next to their car park and the noise of the traffic on the road was loud. We asked to be moved the next day and it was much better. One thing the hotel told us we couldn’t drink water from the tap so we could go and buy some from the supermarket. The water is salty and horrible. I think the hotel should really have provided us with water bottles however a pack of 6 big bottles was only 2 euros in the shop. 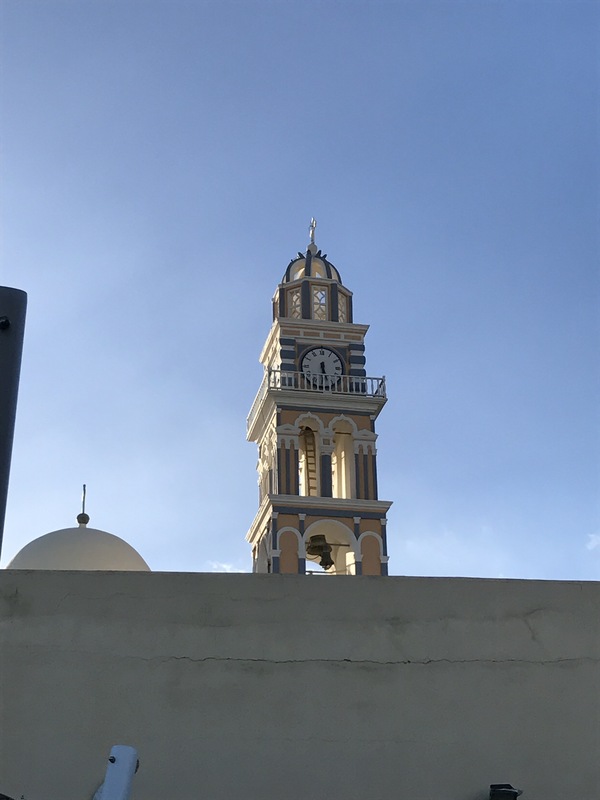 I enjoyed Fira town centre – there was a good buzz about it. The town had lots of little streets and shops and we found a different path everyday. 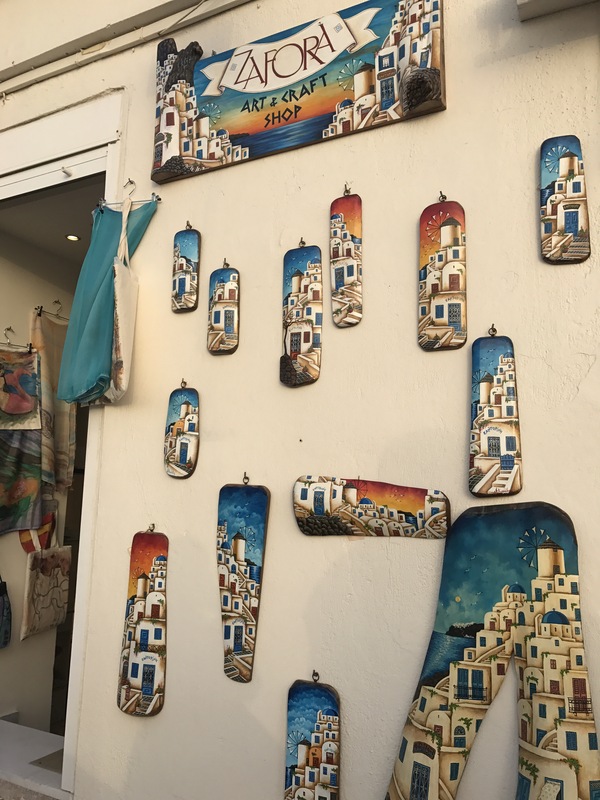 All the shops sell the same items at different prices so worth looking around for souvenir shopping. 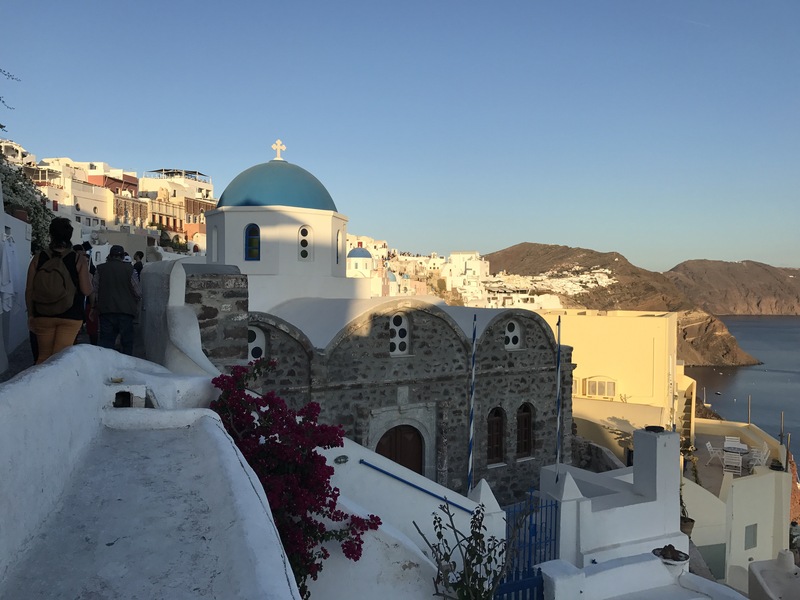 We walked around Fira in search for the beautiful blue domes and pretty churches. It was not as hard as I thought. On route we would find bars with excellent views and have a warm mulled wine. One bar which had great views was PK bar- the only down fall was we had to pay by cash . http://www.paliakameni.com I had a great tasting warm mulled wine there and it came with complementary glasses of water and popcorn. Our hotel offered us tours we could go on and they were similar prices to that we found in the main town centre. We got our recommendations and booked our tours with pelican travel. We paid a bit more for this cruise because it offered towels and carried 15 rather than 50 plus people. The company picked us up from the hotel in a little van and took us to the port. Before entering the catamaran we had to take our shoes off and put away our bags which I thought was a good idea. 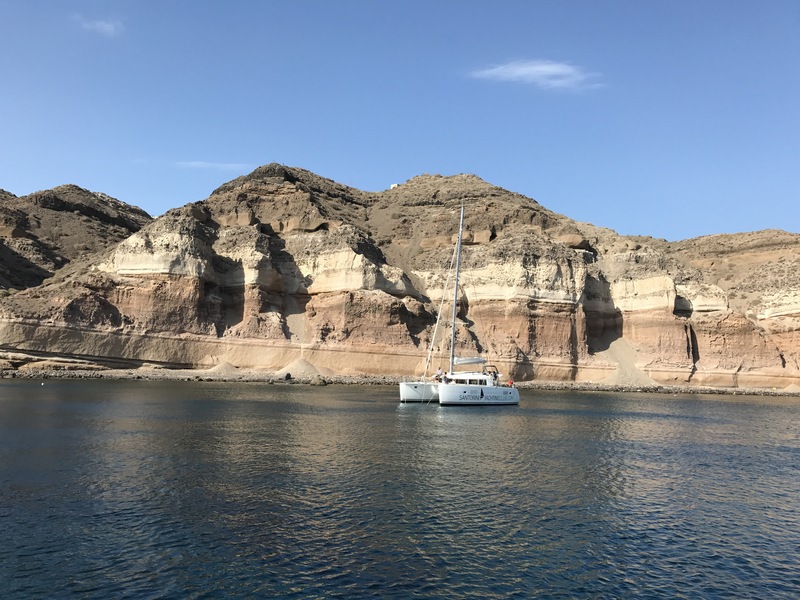 The catamaran passed red beach, white beach, hot springs and stopped not far from the active volcano to watch the sunset and have a late lunch. 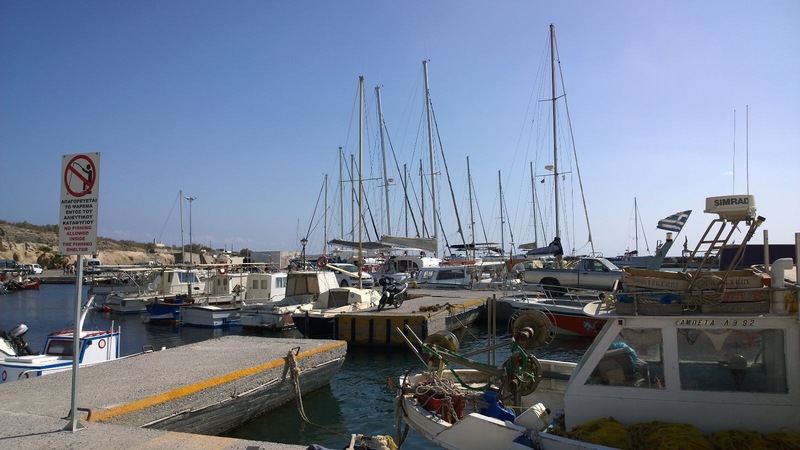 The catamaran was clean and the staff were friendly. The food was tasty too. We could have a swim after the white beach and at the hot springs too. We got to see the beaches but from the catamaran. The hot springs were disappointing because you had to swim in the sea to get to them (the catamaran can only go so far in) and the water at the hot springs was like warm. Also the swim towards the hot springs was not pleasant because there were many rocks which most people grazed themselves on. We only got one towel per person which was a bit of a let down because if you went in the water twice you would have to use the same wet towel. The winds had picked up which made the sea a bit choppy. Some people could not have their dinner properly because they were feeling seasick. This was a shame because the meal consisted of lovely salads, lemon sole, prawns, chicken and linguine. The prawns and chicken were barbecued too. 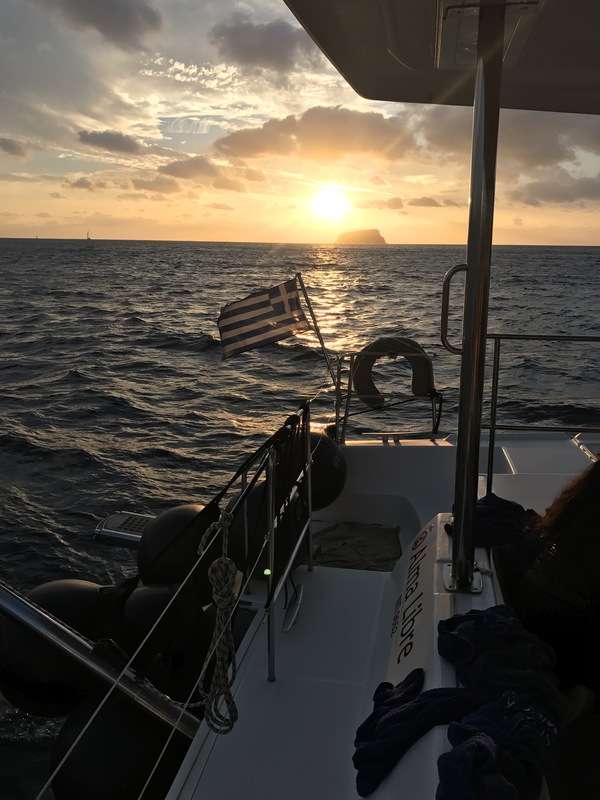 I would have preferred if the catamaran didn’t stop for so long and made it’s was up north to Oia rather than back south to our starting point because it was dark by then and we were in the middle of the sea with no views. Everyone was cuddled up and falling asleep which was a waste of 1.5 hours. Overall the cruise experience was good but I would go on one that carried more people and probably went by Oia which was closer to most hotels. What I think would also be better is if you want to go on a sunset cruise just do a nearby one then get the bus to red and white beach. This way you can actually see the beaches. Also if you desperately want to try the hot springs you can go on the volcano and hot springs tour which is much cheaper and i am guessing you will have more time at the hot springs. We only had 15 minutes. 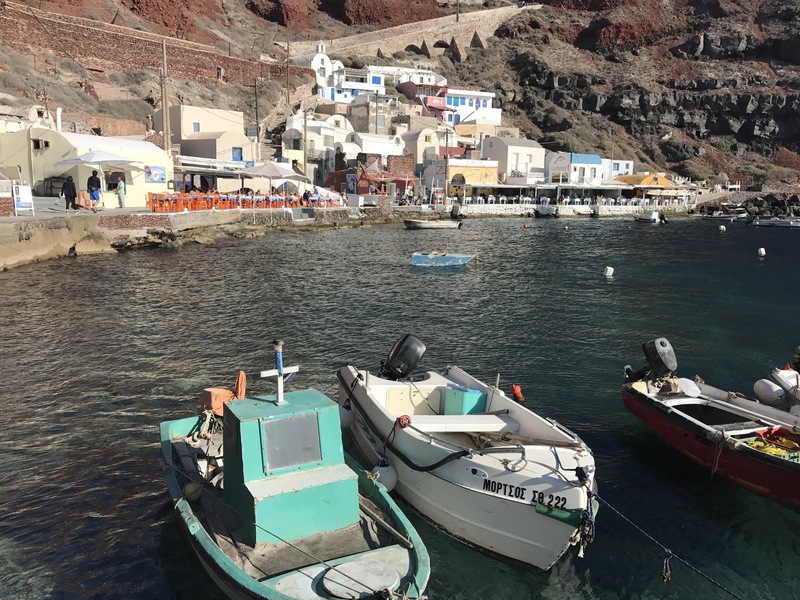 The public transport is good value- it was 1.80 per person from Fira to Oia and Fira to Kamari beach. There local buses are clean and like coaches so the journeys are comfortable. Money is collected on the bus. I would definitely recommend this as a mode of transport. The buses are not dead on time but not overly delayed. They have change on board. 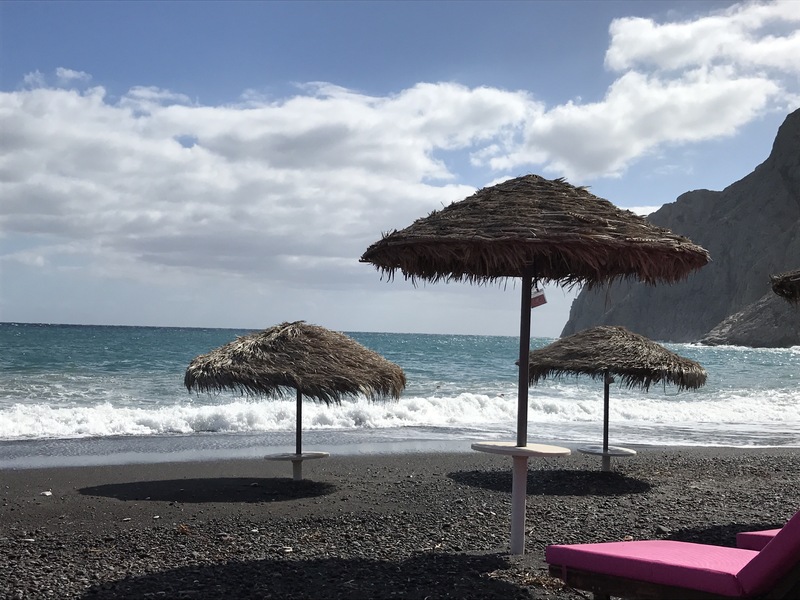 One of the days the weather did not look great and we asked the receptionist what she would recommended and she said Kamari beach. It was a great recommendation. 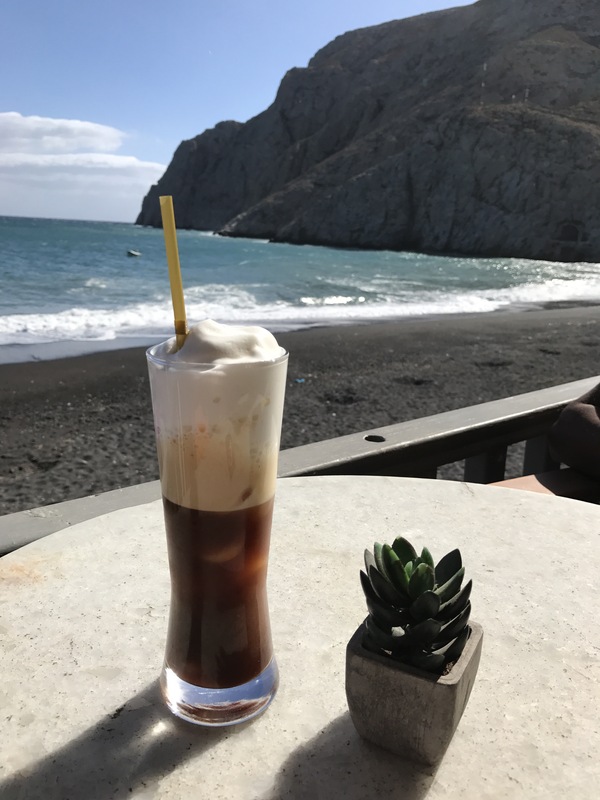 Black beach, great food and drinks and relaxation time! 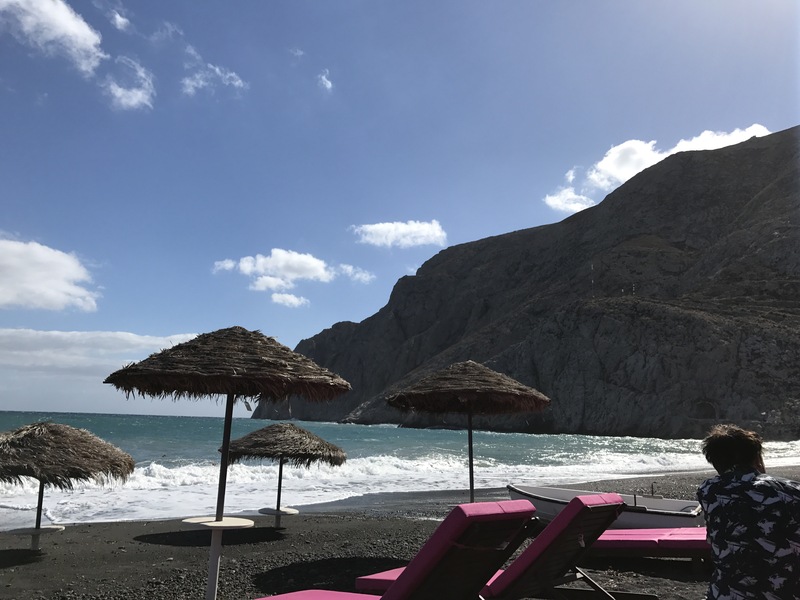 The black beach was clean and warm. The weather was less windy on this side of the island and it was warmer. We walked around the street and picked Hook bar as our stop. If you are a customer there they let you use their sunbeds. The staff were friendly and we had a nice couple of hours watching the waves on a sunbed. A Thai lady walked past selling massages and we managed to haggle and get a 20 minutes foot massage for 10 euros each. It was a good massage too. 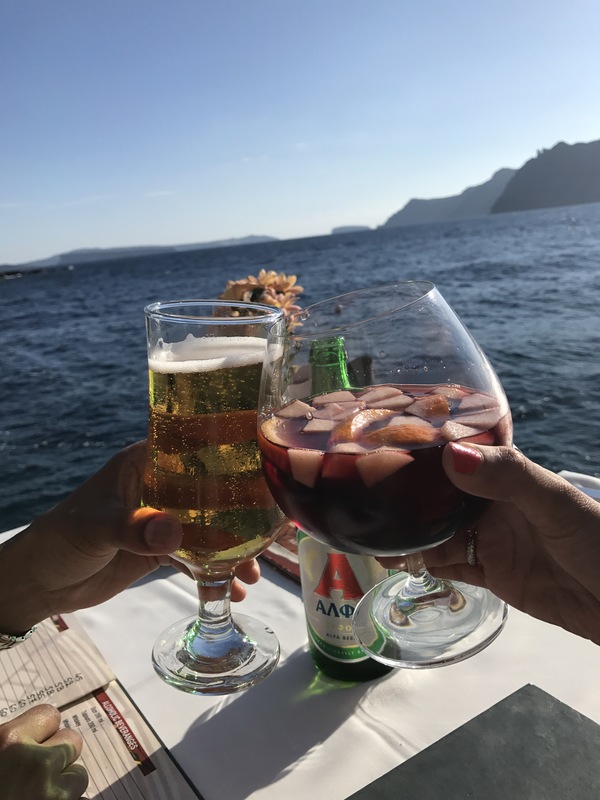 We had a couple of drinks on the beach before going to the restaurant and having a mixed sea food platter for 22 euros. 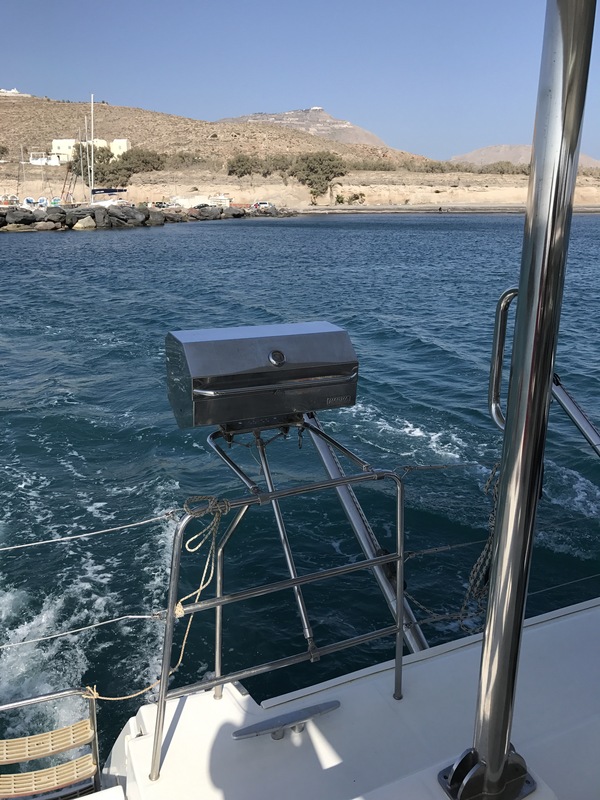 This was a bargain – it had two whole sea basses, calamari, mussels, shrimps, Greek salad, vegetables and potatoes and was plenty for the two of us. The views were great from where we sat and we had a nice meal. 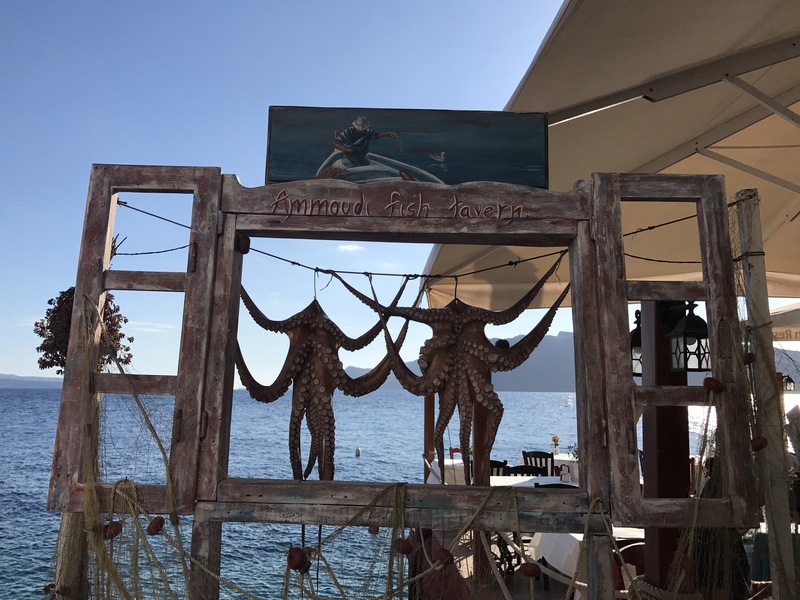 I am not sure if the prices change greatly in the summer however based on our visit I would recommend this bar and a day visit to Kamari beach. On our last day we got the bus to Oia. It was about 25 minutes and went through some windy roads. When we got to Oia the information desk told us where the main sites were located. I wanted to see the blue domes up close, the windmill and the castle. On the internet I tried to find the exact location of these domes because there were some comments on how they were not easy to locate. That is a lie. 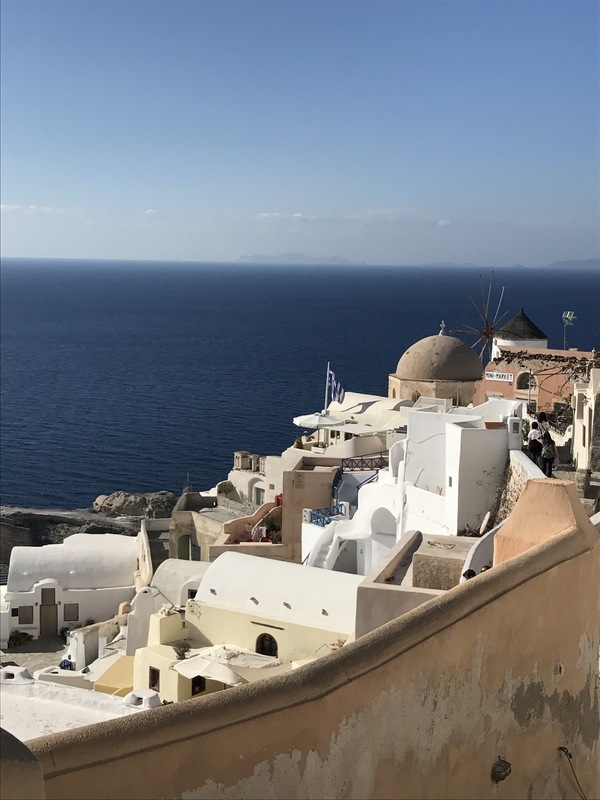 Oia is small and you can spot the blue domes easily. If you walk towards the castle you can easily see the domes and the windmills. 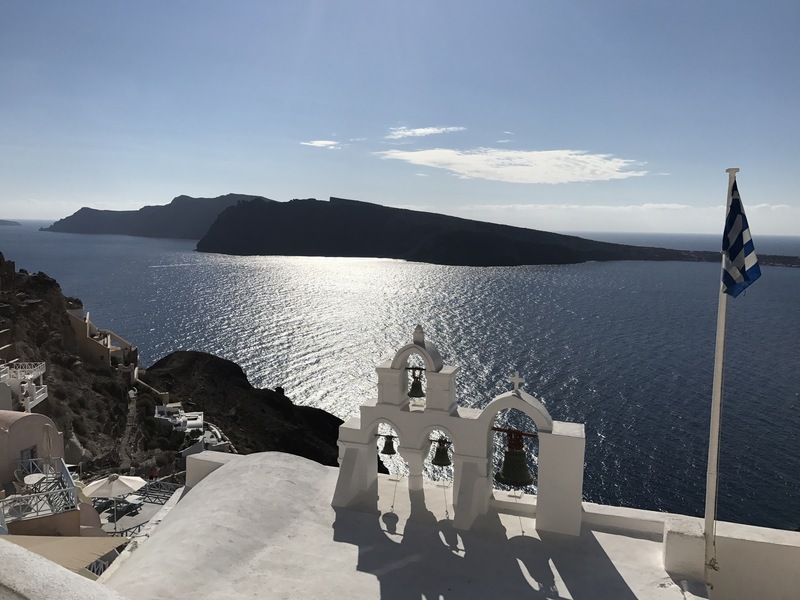 Oia is very different to Fira. 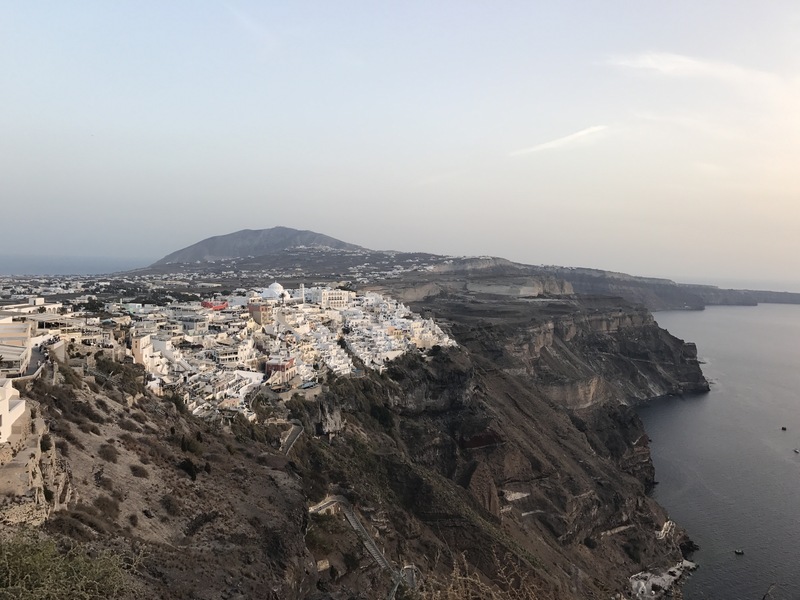 You actually walk on the caldera and pass the villas and restaurants to get to your destination. 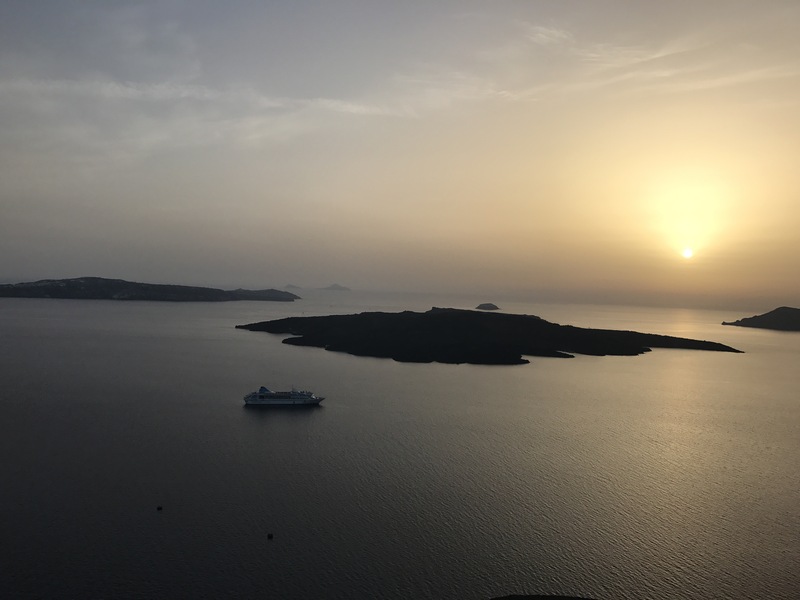 I am glad we didn’t stay in Oia because I think I would have got bored because there is nothing to do but to relax. 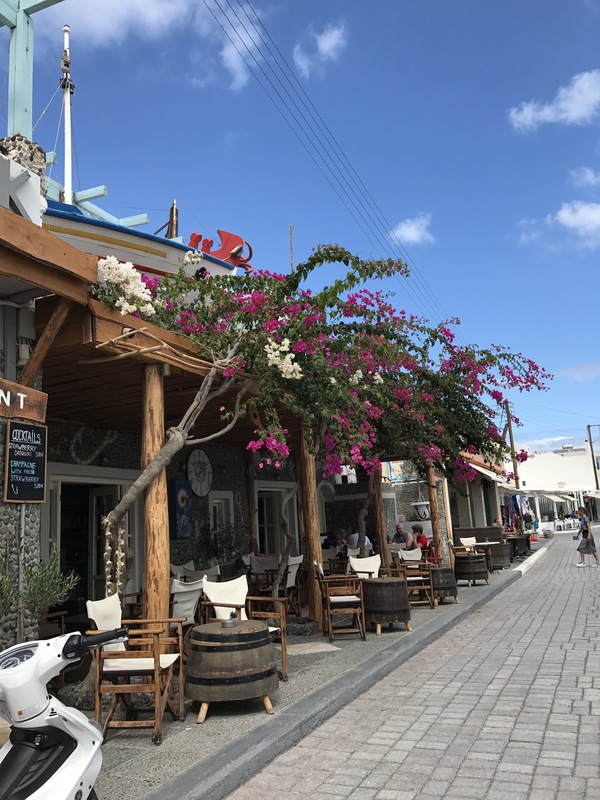 The shops are not anywhere near as those in Fira in terms of variety and number of shops. 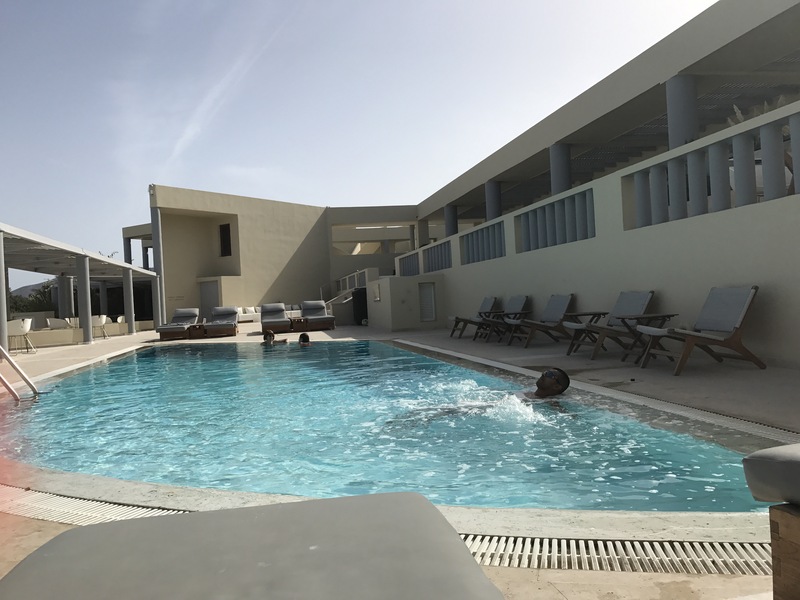 Some people we met on holiday said there isn’t much to do in Oia apart from relax and this may suit some of you. 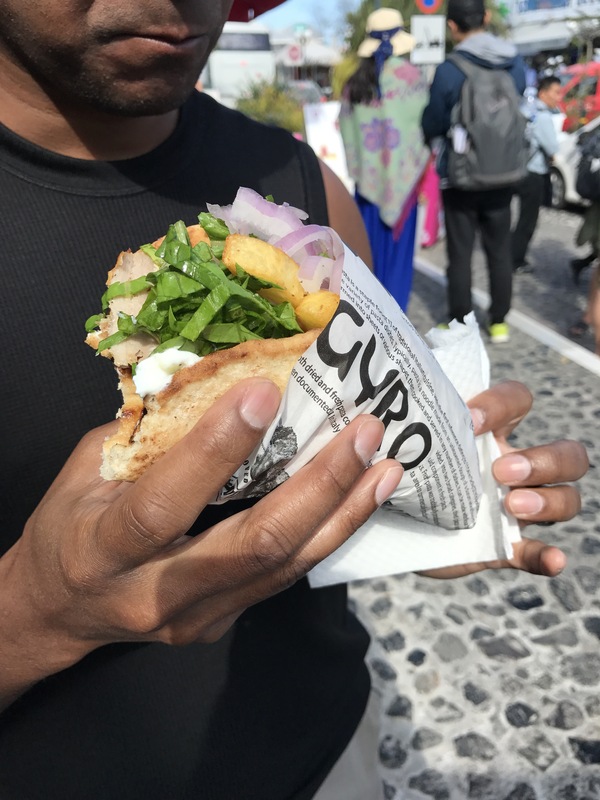 We met some friends who also said they stayed in Oia and the couldn’t find Gyros there. 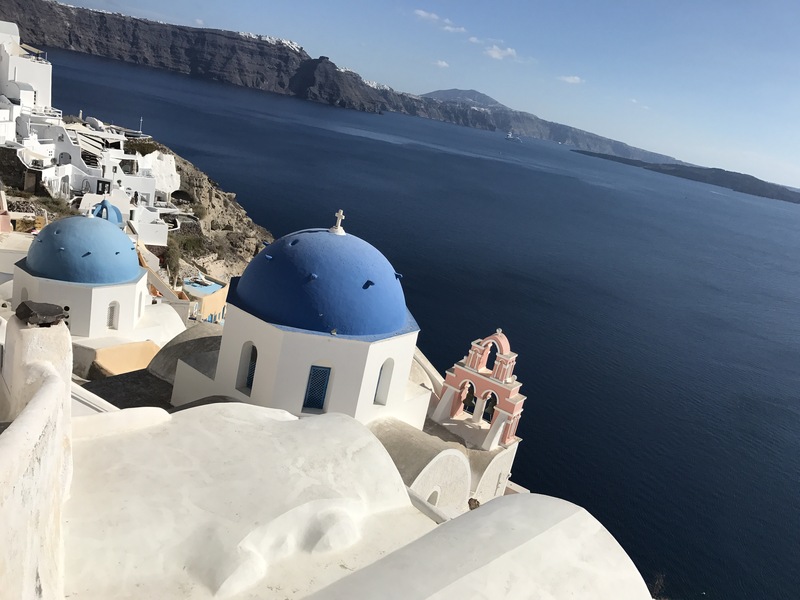 I guess Oia is the ‘posh’ part of Santorini? 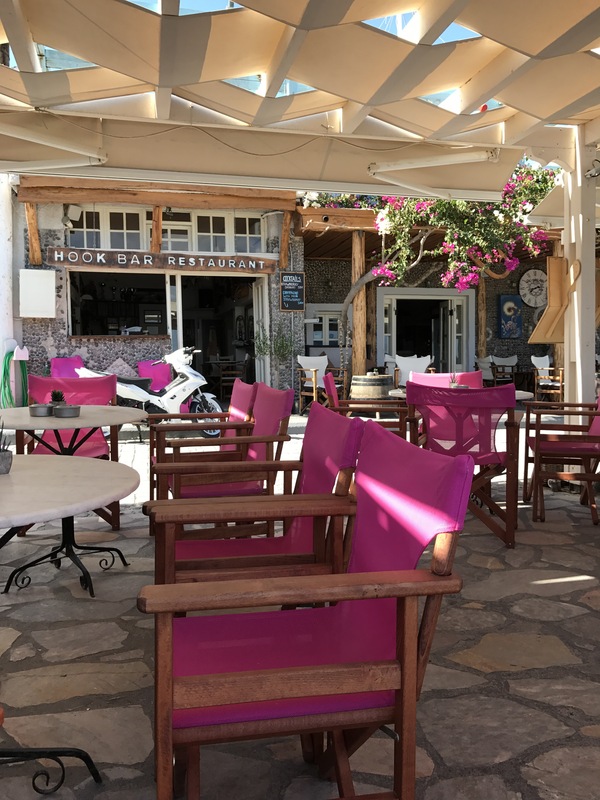 The restaurants seem to be slightly pricey compared to Fira but not extortionate. It’s really pretty and looked exactly like the pictures. It was definitely worth going to. Next time I would stay one night here just to have a little balcony hot tub and enjoy the views. 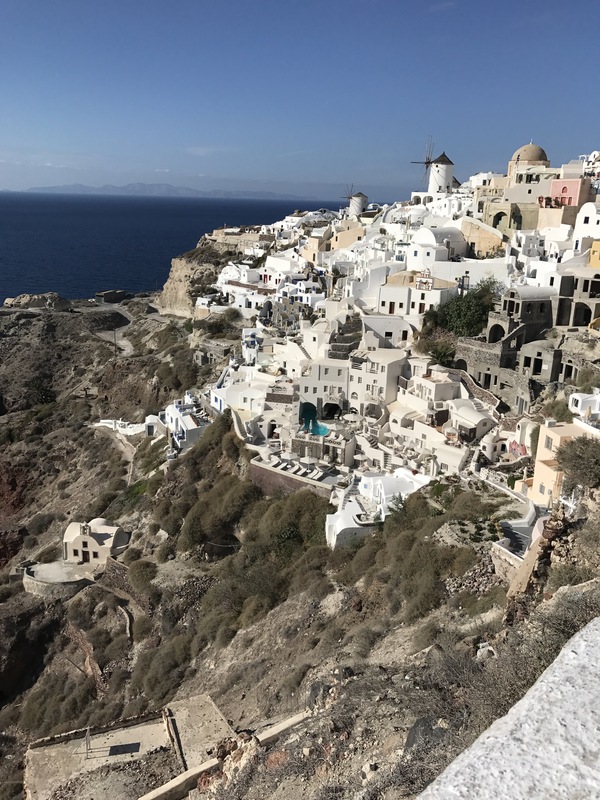 Whilst in Oia we had to may a visit to Amouddi bay.. it was a steep walk down 240 steps. I am glad we were not there is peak season because trying to avoid donkey poo and tackle a crowd whilst walking down the stairs would have been a nightmare. They have donkeys going up these steps at a cost. I am not sure because we didn’t use them. The donkeys poo as they are walking up and you can imagine it’s not pleasant. I think it is someone’s job to brush it to the side because we did see a couple of brooms on the way. The stairs would have been fine if they see not downward sloping. On the way down we got good views of the caldera, domes and windmills. The walk was worth it because the bay was beautiful and the scenes were amazing. 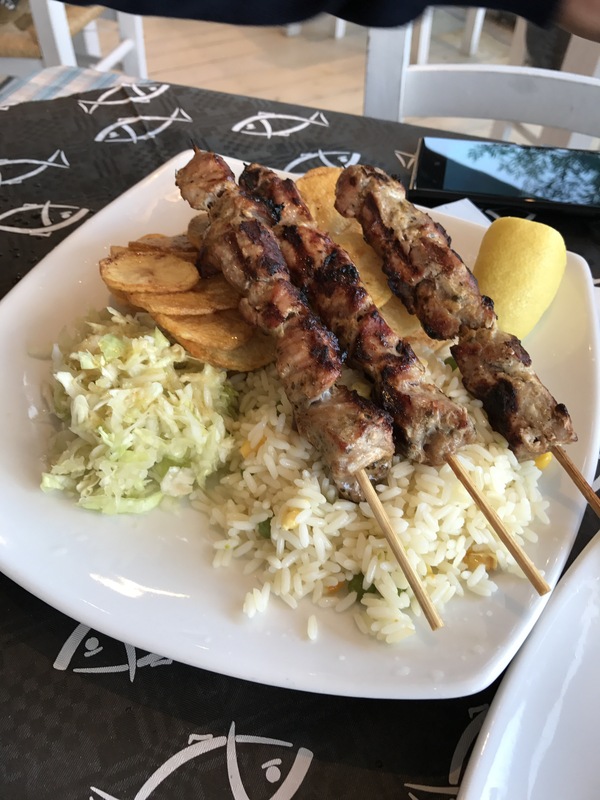 There are five restaurants on the bay and all seem the same in terms of what they serve and the price. We went to the Fish Tavern and had lobster with barley. It was nice and we had a table by the sea which justified the price we paid (£85)! 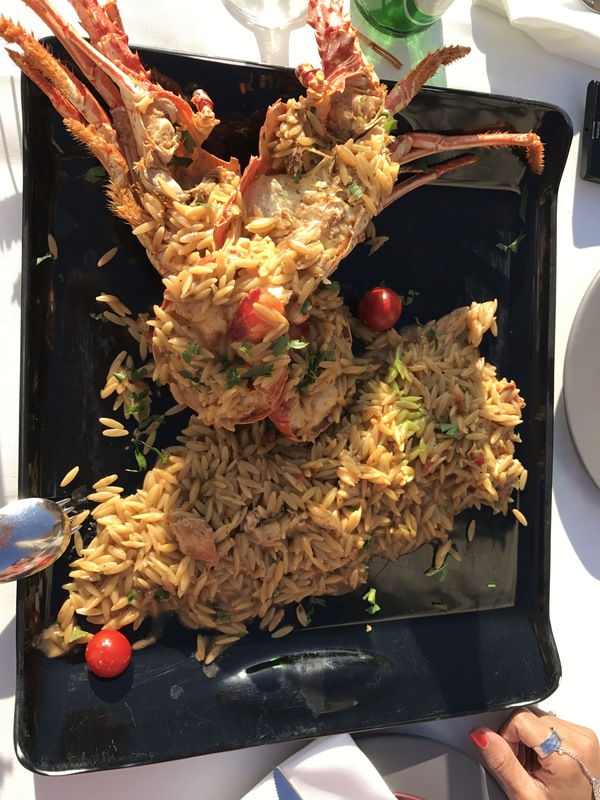 That was however our only expensive meal in Santorini and we knew it would be expensive. The sangri was delicious too. My husband wanted to try their local beer – yellow donkey but that was 16 euros so he stuck to Alfa. Not sure why their local beer would cost so much. After our meal we tackled the 240 steps,this time going up. It was a trek but it was manageable. Again I don’t know what it would be like if the donkeys were moving up and down more frequent. When we were walking up the smell of the poo was more evident and not pleasant. There are taxis that you can get to the Bay if you don’t want to use the stairs. 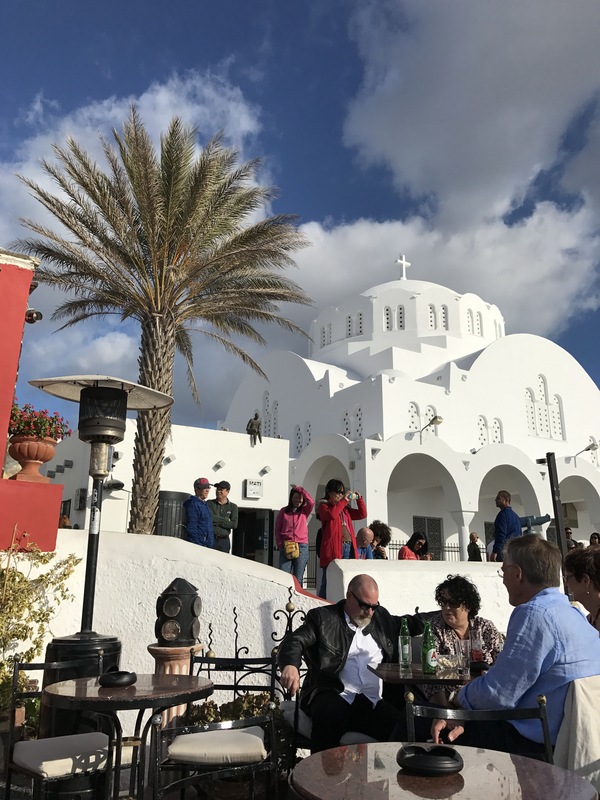 The main spots in Oia( by the castle) get really crowded as the sunset approaches however if you have a walk around you can find less busy places to watch it. 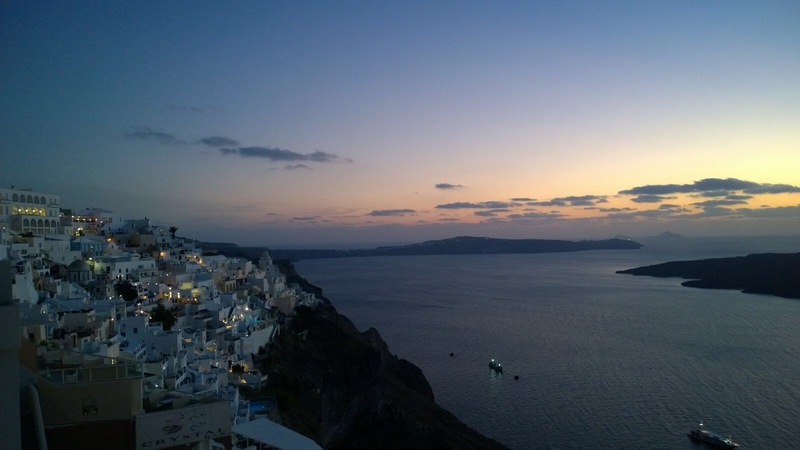 Five nights in Santorini was nice. It wasn’t too short and we didn’t get to the stage where we wanted to go home. 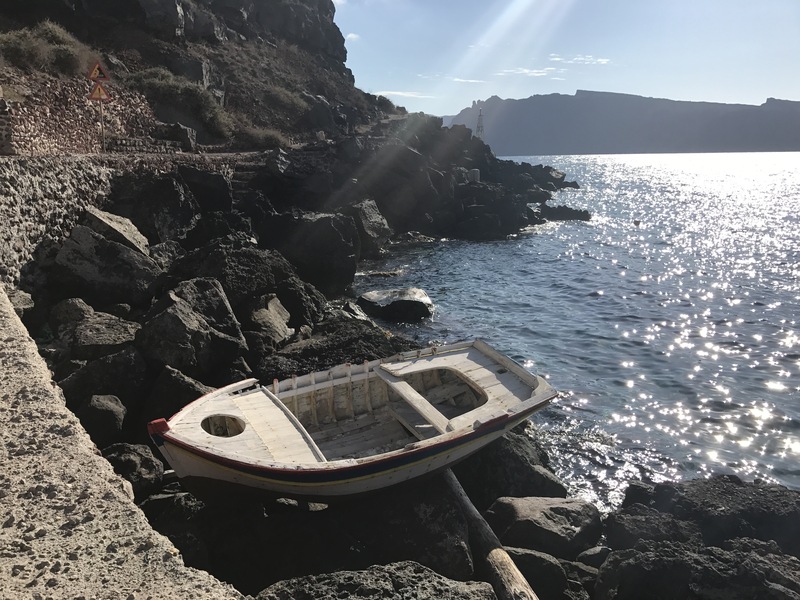 I would recommend one night by the beach, two nights in Fira and one night in Oia for those who like to relax but not totally. Hope this enjoy your stay! 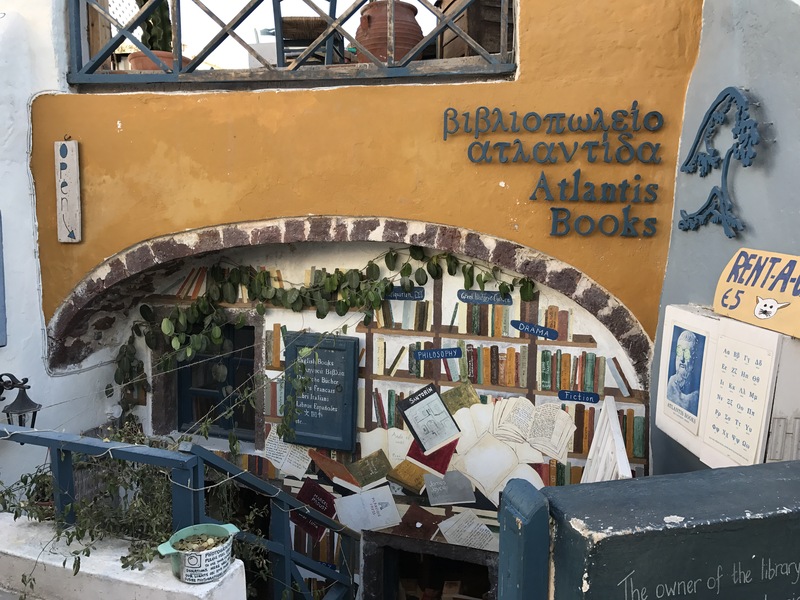 Definitely a place to visit at some point…..
We did a week in Santorini (Perivolos) in May last year and loved it. 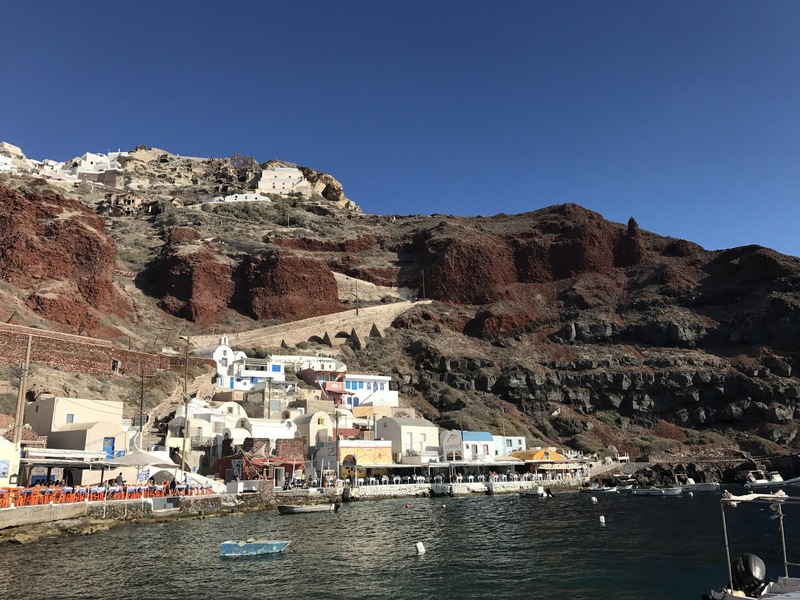 Sidetracked to South Africa this year, we were wondering what Santorini would be like in October. Thanks for filling us in! Great photos, by the way.